The Jowa or Jowo Rinpoche statue is Tibet's most sacred image, which is housed in the Jokhang Temple in the heart of Lhasa. Jowa Rinpoche means 'the most precious Lord', and this copper statue of Shakyamuni Buddha was believe to have been sculpted by the divine artist Vishvakarman during the actual lifetime of the Buddha. Evidently this statue was first presented to the second Chinese emperor of the Tang dynasty, T'ai-tsung, by a king from Bengal in eastern India. Then when a dynastic marriage was arranged between the emperor's daughter, Princess Wen Cheng, and the first Buddhist king of Tibet, Songtsen Gampo, the statue was believed to have accompanied the princess to Tibet as part of her dowry. 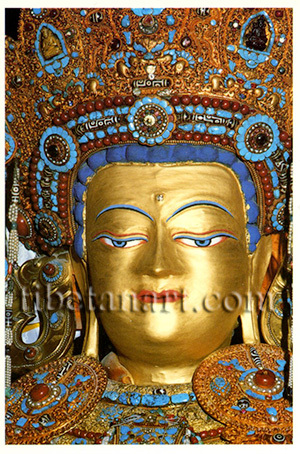 It was first housed in the Ramoche Temple and then later moved to the Jokhang Temple. The statue is heavily gilded with many layers of gold leaf that have been applied as offerings over the centuries. The rich adornments of the crown, earrings and necklaces are fashioned from gold and studded with turquoise, coral and gzi stones. Gzi is an ancient form of Tibetan bead, which is fashioned from a banded cornelian or agate stone with a geometric pattern of angular black and white lines and circular eyes.